The wash­house dates of a time when women did not yet have mechan­i­cal tools to man­age their house­hold. Fol­low­ing their wish the wash­hous­es had been trans­ferred from the bor­ders of the rivers to the vil­lage cen­tre for rea­sons of acces­si­bil­i­ty. Here, the espe­cial­ly cre­at­ed basins were con­nect­ed direct­ly to under­ground springs. The munic­i­pal­i­ty direct­ed the use of this pub­lic tool and a man­ag­er was named to keep and clean the basins. 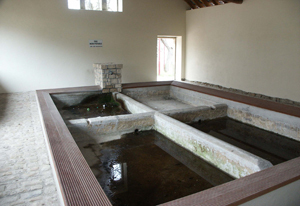 The old basins in the “rue Basse” in Ramel­dan­ge were cov­ered by a roof and sur­round­ed by three walls. The front side of the lit­tle wash­house, made by big ash­lars, is open and allows a direct access to the main basin, which is divid­ed into four rec­tan­gu­lar small basins, embed­ded into the ground floor of the build­ing. A wood­en entab­la­ture sup­ports the semi dark room, get­ting sup­ple­men­tary light from the door and the tre­foil win­dow. 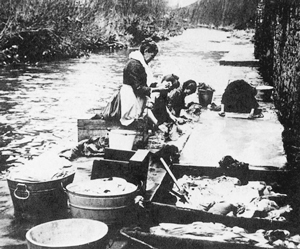 Women in the wash­ing house. When a brook was close to the vil­lage, the laun­dry was done there. In these times the wash­ing process had been very hard work. Before the linen could be brought to the riv­er for rins­ing, it had to be soaped, brushed, beat­en and scrubbed at home. This painful pro­ce­dure, com­mon among the poor house­holds, had lat­er been replaced by the “Bauchen” pro­ce­dure, invent­ed by the rich.This process con­sist­ed in putting the boiled linen on the top of each oth­er so that it could be pre-washed by a show­er of hot deter­gent. 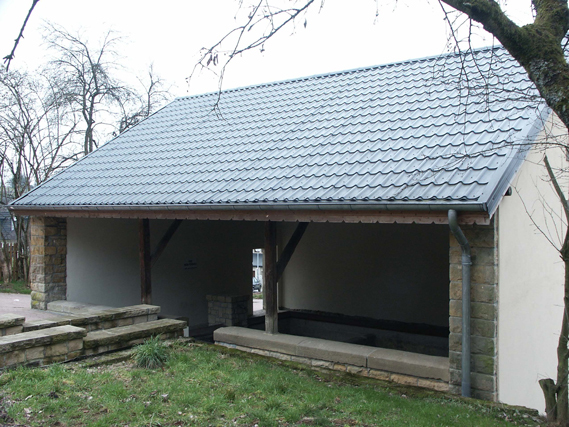 The next laun­dry step as well as the rins­ing could then be done at the “Wäschbuer” (wash­house). 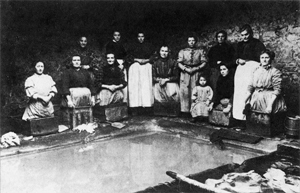 Here the linen was spread into the basins and pushed under water with wood­en sticks. The very dirty pieces had to be treat­ed after­wards with the wood­en wash­board, the scrub­ber or the wood­en beat­ing stick. The rins­ing process took place in anoth­er basin. After an intense wring­ing, the linen could be brought home for dry­ing. The white linen was spread in the mead­ow in order to be bleached.